The Sunday Express has published a story based upon the British military’s work to create a high energy ‘death ray’ weapon for use in the Falklands War. A document written by the former Secretary of State for Defence, Michael Heseltine, for Prime Minister Margaret Thatcher in the aftermath of the conflict in 1983, revealed how the Task Force had deployed ‘a naval laser weapon, designed to dazzle low flying Argentinian pilots attacking ships‘. Heseltine’s letter was among Cabinet papers released by The National Archives in 2013. It forms part of the dossier of material used in my book, Britain’s X-traordinary Files, that traces the British government’s long obsession with death rays. In his briefing to Thatcher, Heseltine says: ‘This weapon was not used in action and knowledge of it has been kept to a very restricted circle’. Ever since H.G. Wells imagined invading Martians who used deadly heat rays to conquer the Earth, military top brass have sought to perfect a destructive ‘ray’ that could be used to spread terror among enemy soldiers and destroy enemy bombers before they reached their targets. But Matthews failed to impress the Air Ministry with his demonstration of the ‘ray’ and took its secrets to his grave. Before the Second World War the War Office offered a standing reward of £1000 to anyone who could produce a death ray that was a capable of killing a sheep at one hundred yards. Numerous ‘secret inventors’ competed with each other to perfect the weapon without success. The development of the air defence radar was one direct outcome of attempts to claim the prize. Papers I discovered at The National Archives revealed how British intelligence deliberately planted rumours about secret work on death rays to distract enemy attention from the real purpose of the Air Ministry’s Chain Home radar stations around Britain’s coastline. But the nearest Britain came to deploying such a hi-tech weapon in WW2 was during the Desert War in North Africa in 1942. After the conflict magician turned wartime wizard Jasper Maskelyne claimed he had used an array of powerful searchlights as an improvised ray to dazzle Luftwaffe pilots during their attempts to bomb the Suez canal. But his claims, that he published in Magic: Top Secret (1949) have never been substantiated. 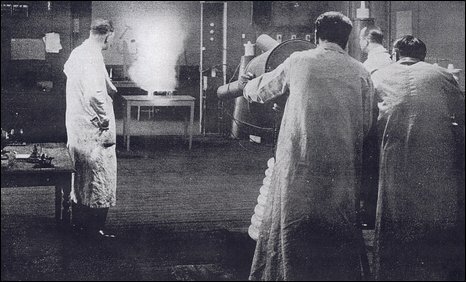 Ever since WW2 military scientists have continued to experiment with death rays under strict secrecy. 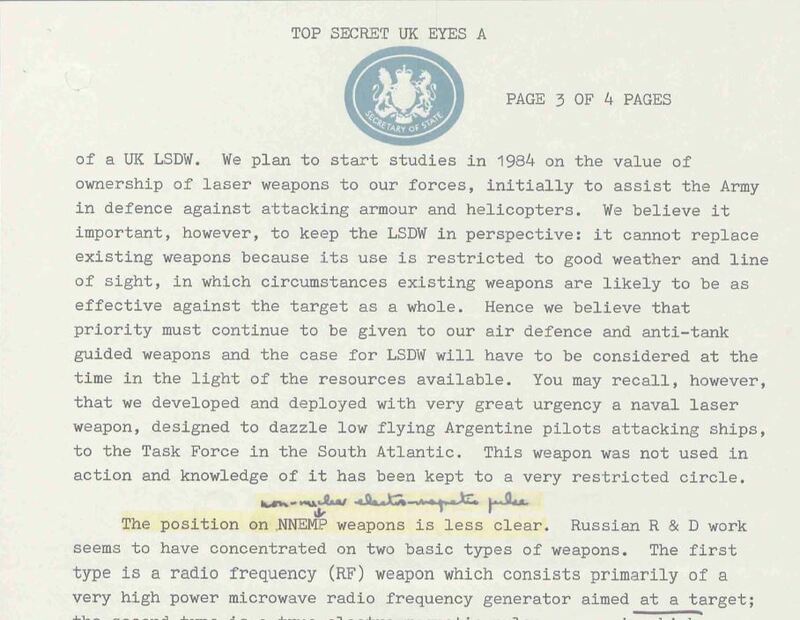 The documents opened at The National Archives revealed how British scientific intelligence were working secretly with United States during the 1980s to develop high powered laser weapons for use against Soviet armour in the event of a war in Europe. In his 1983 correspondence, Michael Heseltine said spy chiefs feared Russia would be ready to field a range of secret beam weapons by the mid-1980s, including a generator mounted on a truck delivering high-power microwave radio frequency blasts. Intelligence chiefs claimed this could affect the electronics systems of low-flying aircraft and attack the human central nervous system. It was also feared the Soviets were working on chemical shells and missiles to deliver high-powered electromagnetic pulses that would jam electronic systems such as Nato radars. Since then technology has moved to direct-energy weaponry aimed at disabling missiles, armoured vehicles and mobile phones. This entry was posted in Uncategorized and tagged Air Ministry, Falklands War, H.G.Wells, Harry Grindell-Matthews, Jasper Maskelyne, Magic: Top Secret, Margaret Thatcher, Michael Heseltine, Naval dazzle weapon, Nikola Tesla, radar, Sunday Express, The Death Ray, The Death Ray man, World War Two. Bookmark the permalink. I love reading things like this just for the official terms, like NNEMP, what does the document make clear what LSDW stand-for? Laser ——- Defense Weapon?